My kids are growing up quickly. On a weekly basis people warn, "Enjoy the times when your kids are young. It goes too fast." My daughter just turned seven and her life is much busier than it was just a year ago. My oldest son is 4 and a half and my wife and I have been saying, "Boy, he is getting big!" Not only is his body growing but so is his self-confidence. My youngest son is about to turn two years old in a couple weeks. He's no longer a baby! He makes me laugh every day and surprises me with all the things he can do. (And my youngest daughter is almost 2 months old already!) My response to the warning is always, "It does go fast. I am very thankful for time I have with my children." This week we celebrated Dan Yaccarino, who's name might not be familiar to most children but many would certainly recognize his work. He has written and illustrated over 30 books for children including All the Way to America: The Story of a Big Italian Family and a Little Shovel, The Fantastic Undersea Life of Jacques Cousteau, and Every Friday. He has illustrated books for famous authors such as Kevin Henkes and Jack Prelutsky. He has developed the award winning animated television shows Oswald and Willa's Wildlife. My kids were excited to find out that he designed the characters for one of their favorite shows, The Backyardigans. According to an interview with Seven Impossible Things, Dan Yaccarino said, "I started out, as many children's book illustrators, as an editorial illustrator which was great training for conveying information visually and simply." His first published book was Big Brother Mike in 1993. In an interview with Core77 he said, "After I had several picture books under my belt, the next step was to move to story books and chapter books, which I both wrote and illustrated. I was gaining confidence with my writing and illustrating, and this was an opportunity to tell more detailed stories." 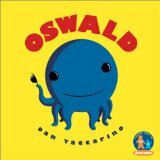 In 2001, a new type of storytelling -- producing an animated series -- began for Yaccarino with the debut of the Oswald TV show on Nick Jr. "I don't think I can experience a feeling like seeing Oswald on TV for the first time ever again. It was a high watermark in my career and for me personally." (Core 77). Yaccarino continues to produce the things he has always loved to do -- children's books like Boy + Bot by Ame Dyckman and TV shows like Willa's Wild Life. He said in an interview with Patricia Newman, "What I do now, I did as a kid. I used to make Super 8 movies, write scripts and record them on a tape recorder, and write and draw comics." 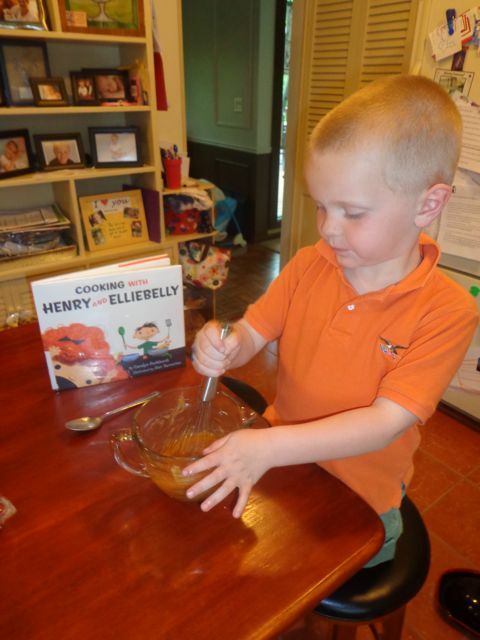 Our current favorite book illustrated by Dan Yaccarino is Cooking with Henry and Elliebelly by Carolyn Parkhurst! I have purchased this book for my children as a gift, but they will have to wait until July to get it. I hope to get Dan Yaccarino to sign the book at the Mazza Museum Summer Conference in Findlay, Ohio. (I'm just a little excited to meet him!) We love this book because of its read-aloud-ability. 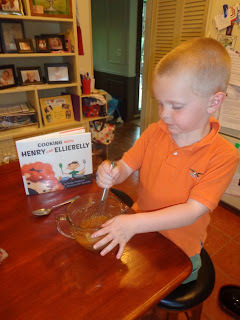 Henry, the older brother, is pretending to have a cooking show with his sister Elliebelly. I admire Henry for including Elliebelly in his show but he quickly learns that it can be frustrating to pretend play with two-year-old. Elliebelly is the star of the book (or show, I guess!). She makes Henry wear a pirate hat and her baby dolls go swimming in the waffle batter. 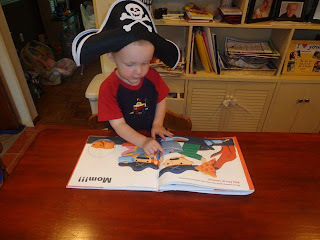 The book is so much fun that it was the inspiration for our birthday celebration activity! 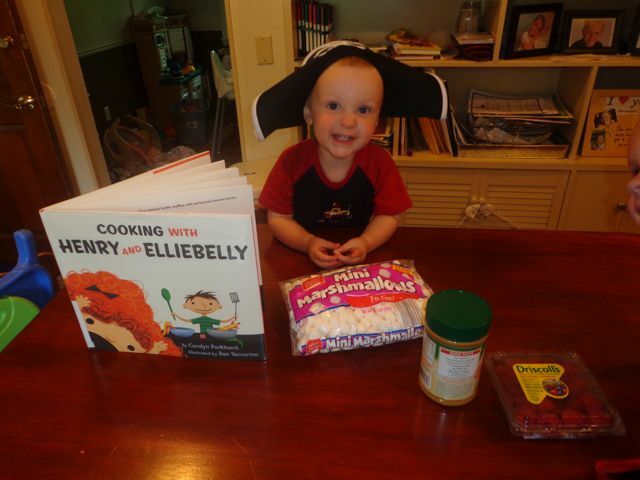 My youngest son (he's our Elliebelly) wore his pirate hat to cook the raspberry-marshmallow-peanut butter waffles just like Henry and Elliebelly did in the book. He found the page that was just like him! 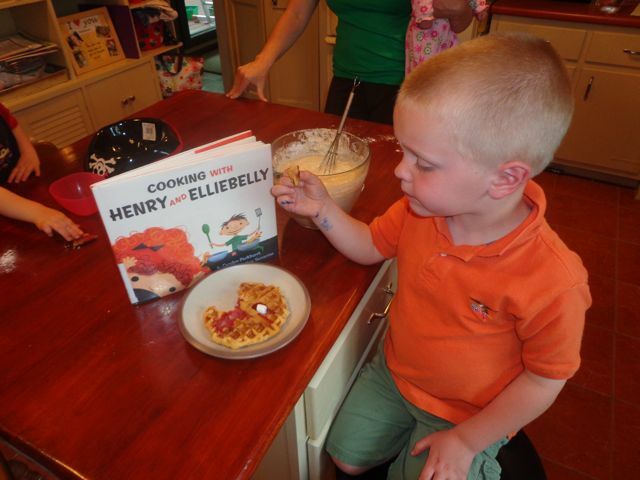 Here is my oldest son (he's our Henry) mixing the waffle batter. 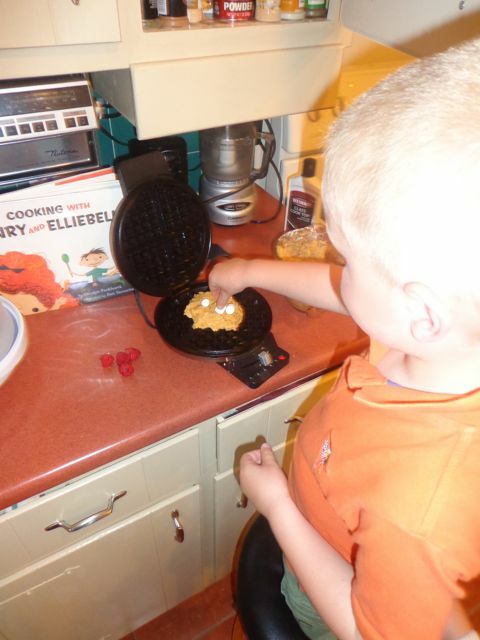 We used a peanut butter waffle recipe from Culinary Kaleidoscope. We also made regular waffle batter for those in the family that didn't want peanut butter waffles. 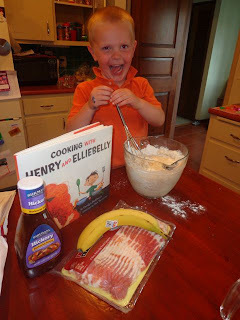 In the book, Henry and Elliebelly also make barbequed banana bacon. We had all the ingredients but my son said, "Yuck! Don't make that!" Henry says in the book, "You have to count how many years old you are: That's how many marshmallows and raspberries you need to add." My son added four of each! Good counting! It looks ready to go! and how they tasted! He ate the whole thing before we were even finished with the other waffles! Thanks Susanna! 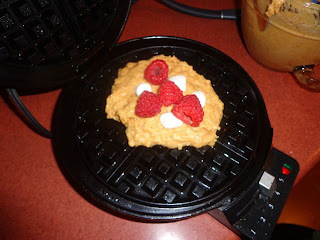 I have to admit that peanut butter, raspberry, marshmallow waffles are actually pretty good! It looks like a great book and it's clear your boys had a fun time! Have you been to Mazza before? If not, it is amazing and the directors and staff couldn't be nicer. And what a cast for this summer's institute! Iza, I went to Mazza last summer for the first time. It was one of the best experiences. I totally agree that the staff is fabulous -- so welcoming and fun. This year, I will be presenting Happy Birthday Author during one of the pull-out sessions. Wonderful! You'll have a great time and they will love you! This is a great tribute to Dan Yaccarino and aren't your kids so cute and clever. It's lovely that you bake with them. I did too this weekend but I ought to more often. Catherine, Thanks for stopping by to read the blog. My boys love to bake together. They know that if you do the baking that you are the get to try everything first! As far as bee stories, I am only a month into my beekeeping experience. Therefore, my experiences are limited. But, I will keep you posted. Oh a brand new venture, well I'm sure you'll bee buzzing with stories soon :) I look forward to checking in on what you are baking. Another fun post, Eric! We have Every Friday here at our house, and both my daughters loved "reading" it when they were a little younger. I think you've inspired me to get it out again for another read! Thanks Kerry! I really like Every Friday. It reminds me of when I would go get donuts on Saturdays with my Dad. Isn't Dan Yaccarino the best?! I love Cooking with Henry and Elliebelly. What a fun inspiration for your celebration. 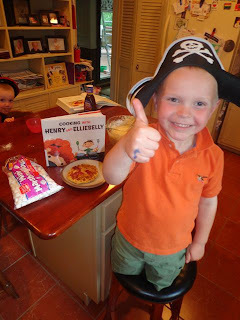 And did you see I just reviewed Boy + Bot this week for Susanna's blog? Happy birthday Dan Yaccarino! I agree Kirsten! He is great! No, I missed your review. I will be over to check it out! Which book will you have him sign? 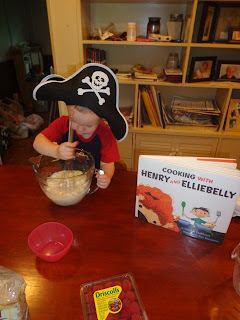 This is a little awkward, since I clearly got here by Googling myself, but I'm Carolyn Parkhurst and I'm the author of the word part of COOKING WITH HENRY AND ELLIEBELLY. I just wanted to say that I just showed your adorable pictures to my son Henry (the inspiration for...um, "Henry"), who's now 10, and we really enjoyed seeing your kids' enthusiasm for the book. I'm glad the waffles turned out well!